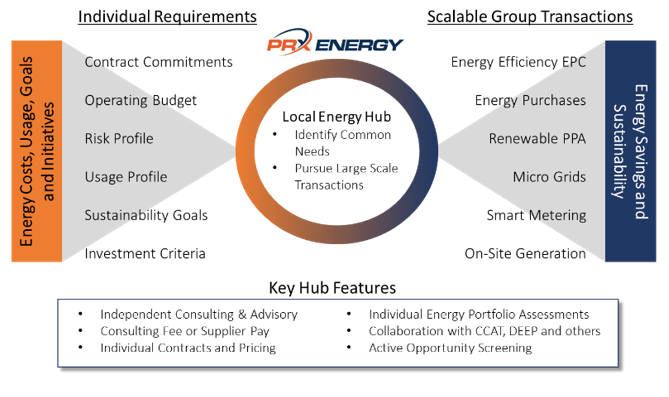 PRX Energy works to understand the energy needs of individual businesses and institutions and recommend opportunities for Hubs participants to work together to increase their scale in the market and pursue transactions with more leverage and market power than they are able to exert individually. By increasing the scale of purchases, Hub participants can pursue opportunities such as renewable energy with better ROI and more favorable contract terms. © 2017 PRX Energy, LLC. All Rights Reserved.